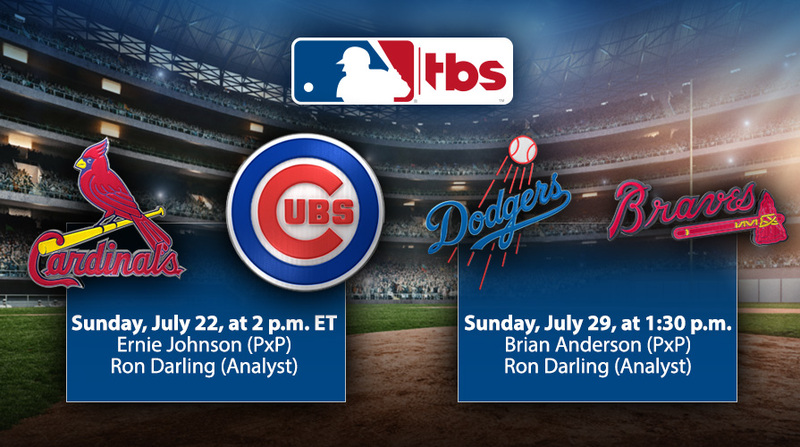 MLB on TBS weekly game coverage will feature a full national telecast between NL Central rivals – the St. Louis Cardinals and All-Star Yadier Molina vs. the Chicago Cubs and All-Star starters Willson Contreras and Javier Baez – on Sunday, July 22, at 2 p.m. ET. Ernie Johnson and Ron Darling will provide commentary for the Cardinals/Cubs telecast. The network will then feature teams battling for their respective NL division titles – the Los Angeles Dodgers and newly acquired star shortstop Manny Machado vs. the Atlanta Braves and All-Stars Ozzie Albies, Freddie Freeman and Nick Markakis – Sunday, July 29, at 1:30 p.m. Brian Anderson (play-by-play) will be joined by Darling to call the game telecast, which will not be available locally in the L.A. market.